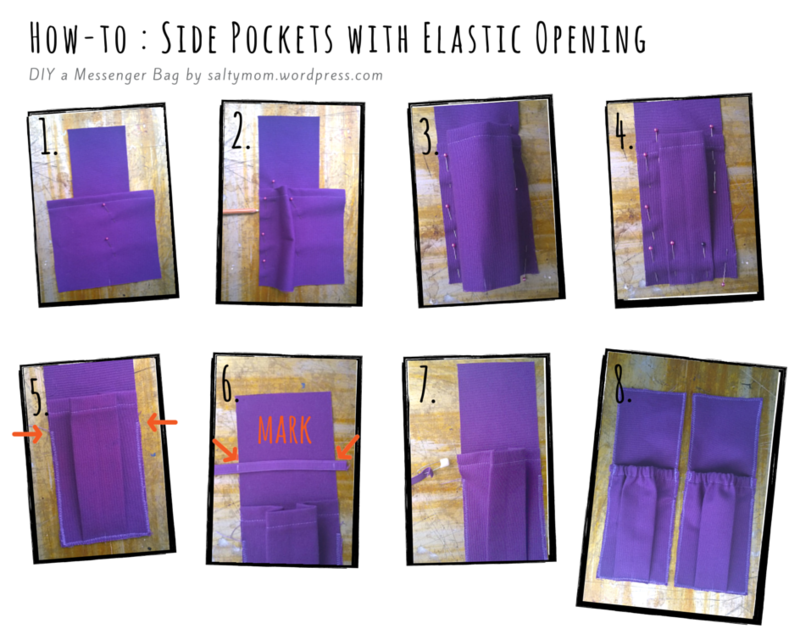 Fold 1.3 cm over one side of the pocket panel twice to form a band large enough for the elastic to pass through. Sew in place. Center the pocket piece over the side panel piece, pin in place. Now, pin one side of the pocket to the side panel piece. Repeat on the other side. You can remove the center pins now. Create a box pleat by folding the sides towards the middle ( see photo ). Pin the bottom in place. Serge the bottom part of the pocket , leaving the band created in step 1 un-sewn. Take your elastic tape/band, measure and mark the width of the side panel. Don’t cut them off yet. Serge all around. Reinforce the sides where the elastic band are with more stitches. Water bottles are heavy ! So now there are a total of 3 pieces created in this messenger bag. 2 side pockets and one long piece with zipper pockets which makes up the messenger bag’s front/bottom/back. We will now set that aside and sew up the inner bag in the next tutorial.